For quite some time I have paid close attention to tool grips. I have even made quite a few odd ones just to test ideas. These taper the opposite way of a lot of handles. Not good for whacking, but for pushing, they are great. For a large handle, this is my favorite design. For small portable tools, these tapered and rounded square handles do pretty well. The rough octagonal handle shown in the foreground of this picture is surprisingly comfortable and manageable. In my playing around with handles, I have discovered that I am liking shorter handles, with at least one flat plane, more and more. While the aesthetics, feel and grip of a simple egg are superb, without a flat, the tool tends to wander around the table top. This can destroy tips, edges, feet and legs. If you try to catch them, hands can be damaged. This tool fits well to the palm of the hand and allows the force to distribute evenly. As a result It can be used with great pressure and produces little fatigue while doing it. Having a flat on a tool is usually better. Having several flats is even better still. Too many and the tool will start to roll. 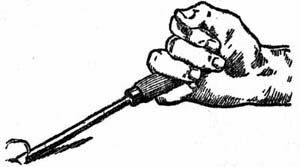 Too few or too pronounced a flat, and the tool becomes polarized to a particular position in your hand. This may be idea, but if you use a lot of grips, it can be limiting. Flats, as long as they are not too long, can give a tactile reference and allow you to feel when your grip is correct. So for some background on tool grips and with it lengths, there are some great references at McClain’s Printmaking Supplies . Some of their documents such as this one, advise users of their Japanese Tools to cut the handles length down. 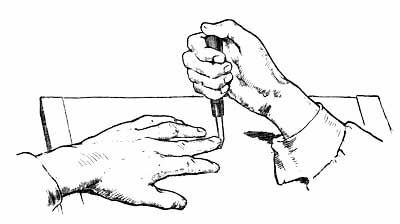 Their advice is, if you hold your hand splayed open, the distance, between where the web on your thumb ends to the farthest point of your middle finger, is the handle length advised. For me that is right on 7″ so I have not cut down a lot of tool handles. In fact I find 7″ a bit long or alternately quite well long enough. 7″ is quite nice in fact for a tools entire length. The question of the best handle shape is further complicated by the range of grips that one might desire. Some conventional grip are quite instinctive, but there are a lot of grips that have been tested and used over time, that may preclude some tool shapes. 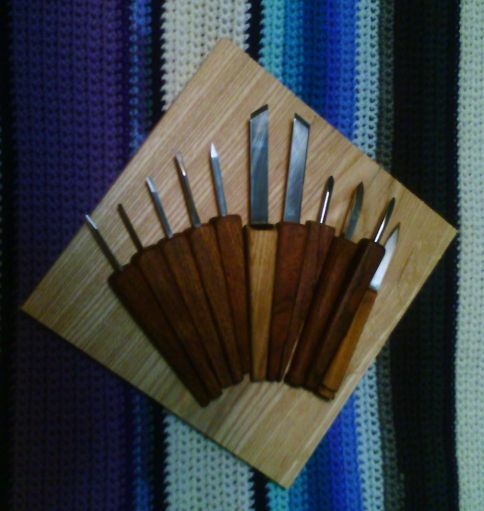 as do two articles at McClains, The Traditional Way to Hold Japanese Tools and The Traditional Way to Hold The Knife. Some tools have broader flairs at the back, to facilitate palm grips and mallet use. 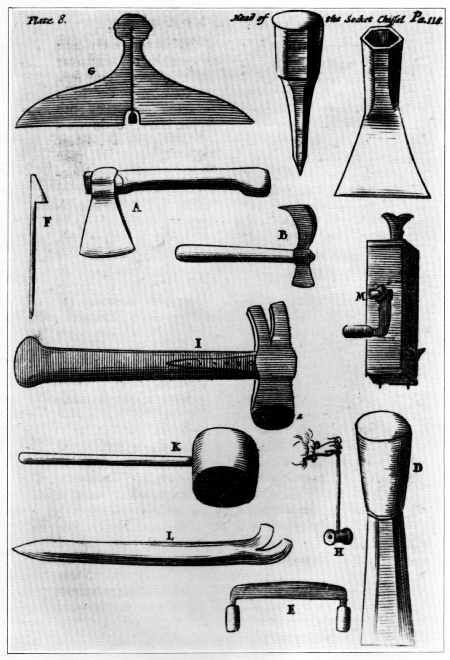 Woodworking Tools 1600–1900 by Peter C. Welsh Has several plates from Moxton’s The Tools of the Joiner Woodworking Tools, one of these plates, shows what looks like a short octagonal or hexagonal grip flaring towards the back with a bit of a rounding or flair back at the end. There they are, center left. Same handle almost for gouge, mortise chisel, skew, fishtail and straight. Plate 8 shows a hexagonal socket. I am really fond of hexagonal shapes, and generally prefer them to octagonal, but from my own playing around, octagonal is preferable on a handle to hexagonal. Hexagonal forces the hand to hold the tool at particular angles. If aligned right, this may be fine for a particular user, but a hexagon allows quite a bit more tweaking. A faceted handle has many advantages apart from the safety and convenience of the tool staying put. It also gives the hand some reference as to the angle it is being held at. It makes it easier to repeat a how you hold it. As far as hexagonal handles go, Frog, has some nice handles for reasonable prices. I have not tried them, as the economic swings have not rewarded those who try to maintain quality public education, but I suspect they will do nicely. The 81M6 to 81M10 are the ones I rather like. While you are at Frog, look around, their range and prices are quite tempting. Oh, but for flipping great wodgers of cash, I would be all over their catalog! 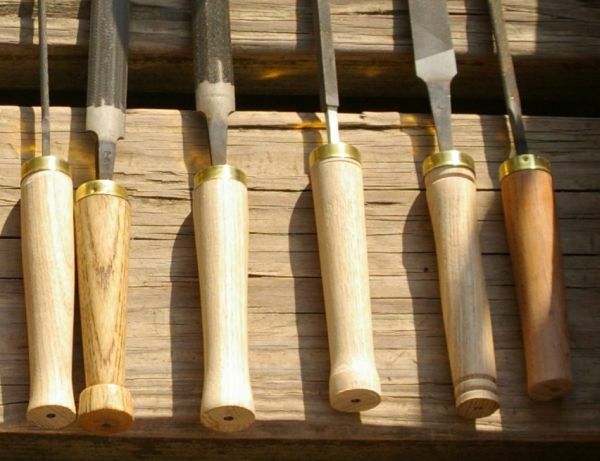 Over on Timber Frame Tools, is an excellent article on tool grip shapes, that points further to a few other superb articles on octagonal grips. He should have also pointed to his own article on making hexagonal cross sections, it is superb as well. I like Don McConnell’s PDF on Octagonal Handles quite a bit. They are good pounders and pushers, they are simple and elegant. Stephen Shepherd’s Octagonal Handles are delightful. Clean lines and simple in form. 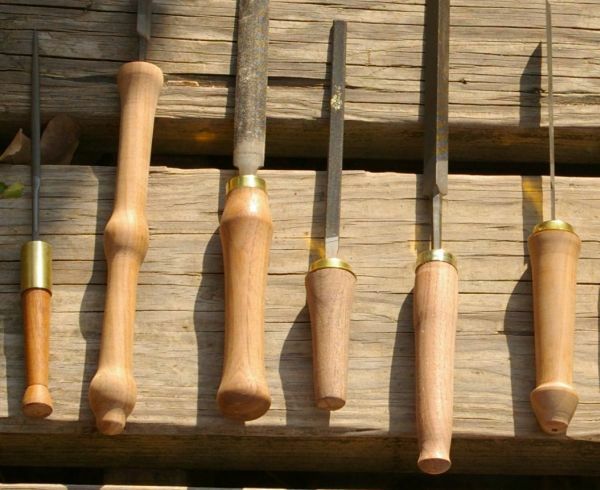 Bibliophile, on The Literary Workshop Blog, shows in detail how to carve, an octagonal handle for a socket chisel. He uses a draw knife, rasp and spokeshave, and ends up making as even a hexagon as you could ask for. The Schwarz even shows a preference for octagonal hammer grips, although from the picture the handle looks to be as hexagonal as it is octagonal. I do not remember who was involved, but I do recall at one time reading a discussion where several experts on hand tools agreed that a slightly flattened octagonal grip was standard and preferred. Stephen Shepherd relates that he has pretty much switched all of his tools over to tapered hexagonal grips. That speaks fairly strongly for his preference as he has handled and used quite a few. 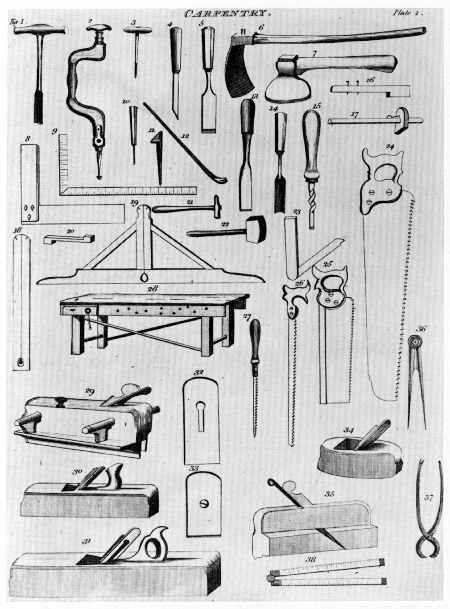 Thomas Martin, in his, The Circle of the Mechanical Arts, London, 1813, shows a few handles that look pretty much just like what Stephen prefers. My next experiment will be to try and make a few similar to this, a few like Don McConnell makes and a few that are a bit squatter, as the Moxton illustration shows, for resting in the palm. When I say try, I mean it. Getting a tapered hexagonal handle right, is a much better show of skill than it seems to be at first glance. Trevor Walsh over on TWD Shop, shows a process for making a tapered octagonal handle, that looks like a winner, I am going to have to give it a try. Who knows, I may find one I like enough to try and produce a set. Currently my tool set is more like a mixed range of China. Then again, I am rather charmed by mixed sets of China. This subject is explored even further here! Fantastic treatise on handles. I enjoyed it greatly, and thanks for the mention, it startled me to see it. I agree with your notes on file handles too. I’ve sort of grown to appreciate what most would consider a backwards taper for them. The handle on Christopher Schwarz’s favorite hammer handle is indeed octagonal (I have one just like it) the flats on the hammer side and claw side have only a very small flat so it is hard to see in his photos. There was an article (I think as a PDF) that I ran across once that dealt with a couple of hand measurements that would lead a person to determine their “perfect handle” but when I was gathering my links for my blog post on the topic I could not find it again. I was hoping it was one of the printing references you made, but it was not. Maybe one of your readers will know what/where it is. I am happy you liked it, as I definitely enjoyed yours! I would love to see that article. I have found a few articles on ergonomics that have some relevance but nothing that seems to match with a solid measure of hand to measure of tool. Apparently grips that terminate in the palm are not favored due to how it effects the wrist angle and the stress on the palm tissues. I’ve seen those. I think the Google book may have referenced the study I was thinking of. 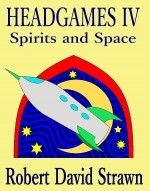 I’ll have to trace back through some of the footnoted items and see if I can find it. I like the diagram on page 19 that shows a large increase in torque with an octagon handle (for screw drivers) while at the same time showing less force being needed in grip strength when compared to a round handle. Interesting about the palm tissue, I hadn’t realized that. Another set of search terms came up with an article titled, The Effect of Tool Handle Shape on Hand Muscle Load and Pinch Force in a Simulated Dental Scaling Task. When you consider the force, care and angles required for scaling teeth, it is a worst case scenario in many ways. A lot of sideways, and pulling motions as well as pushing are made with good force and tight control. Their data indicates that a taper is best. They only used 7 and 10 mm diameter tools for testing, but the 10mm tool was considered superior. The test did indicate that smooth was better than hexagonal. Most actions made by these dental tools are pull strokes, the grip is a pinch grip and apparenty little rotational force is involved in cleaning teeth, so this data, while being useful, may not strongly apply to a most woodworking tools. So it is probably well worth keeping in mind, but not definitive by any means. A PDF that might well be what you were referring to, indicates that if you make an OK sign with your thumb and index finger, the diameter inside the circle formed is the correct diameter for a tool. by Yong-Ku Kong and Brian D. Lowe, indicates that an ideal diameter would be 19.7% of the distance from the tip of the middle finger to the crease where the wrist starts and the palm ends. by Yong-Ku Kong, Brian D. Lowe, Soo-Jin Lee and Edward F. Krieg, indicates that a double frustum shape is best for transmitting the most power from the hand. A round cross section was also better than oval or hexagonal. Octagonal sadly does not appear to have been tested. Oooh so much to read and so little time. Time to read and do some digesting of this info. Thanks for the added info. I would read them with a careful eye, I made an example of the first one. It came out as 1 3/4″ in diameter for my hand, way too big. The other came out close to 1/2″ in diameter. This is way too small. Since these results are the only measures I can test, I kind of suspect the rest. My guess now, is that you want it as big as is comfortable and grips well. That will keep your hand from cramping and distribute the forces to more of your hand. The real question for me is whether an octagon puts more stress on due to micro-adjustment or less stress due to positional feedback. since the bones swivel all the way back from the elbow, I suspect that micro-adjustment is no big issue. So my guess is that the solidity of the grip and the feedback makes the octagon superior.